Coach's Corner - Derek Jeter hand signed SPECIAL Yankees jersey. Go Back to Lot List Derek Jeter hand signed SPECIAL Yankees jersey. 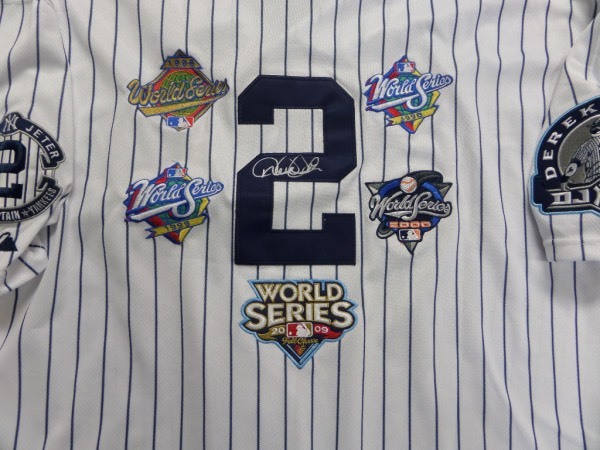 This incredible, specially made home white pinstripe has patches galore sewn on, and honors the World Series star and Yankee Captain nicely. It comes back #2 signed in bold silver paint pen, everything here is a 10, and value on the Majestic display and future HOF investment jersey is $2500.00. If your a fan of either Jeter, or the Yankees, it is truly a must have!